I watched Alice over the weekend and I thoroughly enjoyed it. I thought it was a clever extension of the original tale- especially since I only vaguely remember what happened way back then, which goes really well with Alice’s own hazy memory. It may not be everyone’s cup of tea, but I personally loved the whimsy of it all. It was almost like a fairy tale for grown ups! Another thing I loved about the movie were Alice’s dresses- and there were loads of it since she kept on shrinking and growing! They were all so pretty, girly and blue (well except for one of them). 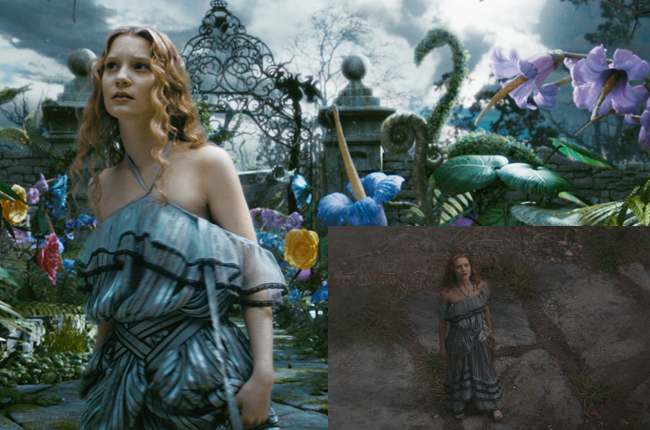 The blue dress she wore in the first scene (above) was classic Alice. The second one, supposedly a derivative of her petticoats, was gypsy inspired. I’m not a big fan of the bulk, but the halter top with the sloping shoulders design was intriguing as was the striped print. The third strapless dress, the one the Mad Hatter made for her, was charming. It was my favourite one. You should’ve seen the cute sandals that went with it! I’d definitely wear this dress! I must go research some SS10 Alice inspired fashion i.e. light blue with lots of cute girly details for myself! I loved this movie! I blogged about the ASOS Alice in Wonderland lookbook… I think you’ll find what you’re looking for there! this was such amazing movie, and mia looked so hot in the armour outfit! I also enjoyed Alice in Wonderland, much to the confusion of my fiance- he thought it was a bit lacking due to all the hype.